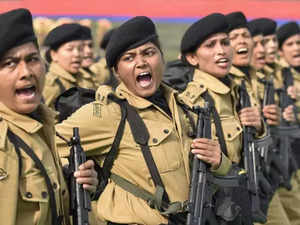 NEW DELHI: The Union Home Ministry has launched a massive recruitment drive to fill 76,578 vacancies, including 7,646 posts for women, in Central Armed Police Forces(CAPFs). In a statement, the home ministry said out of these vacancies, 54,953 posts are for the constable cadre and they will be hired through the Staff Selection Commission (SSC). Out of the 54,953 posts of constables, the CRPF has the maximum 21,566 vacancies, followed by the BSF (16,984 posts), the SSB (8,546 posts), the ITBP (4,126 posts) and the Assam Rifles (3,076 posts) and the remaining being in the CISF and other CAPFs. For the entire exercise, the SSC will start a computer-based written examination from this month itself, the statement said. There are 1,073 vacancies in various CAPFs at the level of Sub-Inspector, out of which 38 posts are reserved for women. The BSF has the maximum 508 vacancies of SI, followed by the CRPF (274), the SSB (206) and the ITBP (85). Direct Recruitment for these posts also will be made by the SSC through a written examination between February-March. At the level of the Assistant Commandant, there exist 466 vacancies for which direct recruitment is being made through the UPSC. The result of the written examination to fill these posts has been declared on January 1. In addition, 20,086 vacancies pertain to promotional posts and in other cadres such as tradesman, ministerial, medical, paramedical, communication and engineering and these are also being filled by the CAPFs. Thus, in all 76,578 vacancies are getting filled up, the statement added.